The United States has not updated its nuclear weapons program in decades, but in February President Barack Obama allocated more than $1 trillion to the modernization of the country's nuclear stockpile. Perhaps he got tired of hearing jokes about servicemen using floppy disks to activate missiles, but regardless of the catalyst, the US is preparing to create a brand new nuclear weapons system that includes connecting its missiles via a secure network. In 2017, 50 men and women on the Air Force Scientific Advisory Board will be tasked with figuring out what could go wrong in this brave new world, Defense One reports. 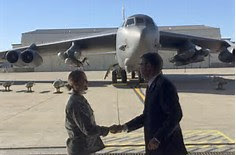 The board's chair, Dr. Werner JA Dahm, tells Defense One that a number of the US' nuclear systems need an update, including the B-21 stealth bomber and the nuclear-armed cruise missile known as the long-range standoff weapon, or LRSO. "These systems are going to be quite different from the ones that they may replace," Dahm says. "In particular, they will be much more like all systems today, network connected. They'll be cyber enabled." A connected nuclear system presents new challenges in terms of safety and security, potentially creating new ways for bombs to accidentally deploy or otherwise become compromised. The Air Force Scientific Advisory Board will dissect these possibilities and attempt to provide solutions before the upgrade process begins in earnest. Dahm tells Defense One the Air Force wouldn't conceptualize new nuclear systems without first outlining ideas for addressing security or "surety" concerns. "You have to be able to certify that an adversary can't take control of that weapon, that the weapon will be able to do what it's supposed to do when you call on it," Dahm says. "It isn't just cyber. That's definitely the biggest piece, but ... when was the last time we built a new nuclear system? Designed and built one? It's been several decades now. We, as an Air Force, haven't done certification of new nuclear systems in a long time. These systems are different. ... What are the surety vulnerabilities for such a system, so to speak? How would you address them? How would you certify that the system will work when you need it to work and will do what it's supposed to do?" The US nuclear program took center stage this month after President-elect Donald Trump said he wished to expand the country's nuclear capabilities. "Let it be an arms race," he said. "We will outmatch them at every pass and outlast them all." This stance flies in the face of nearly 40 years of international nuclear disarmament agreements, laid out in the interest of avoiding global catastrophe.